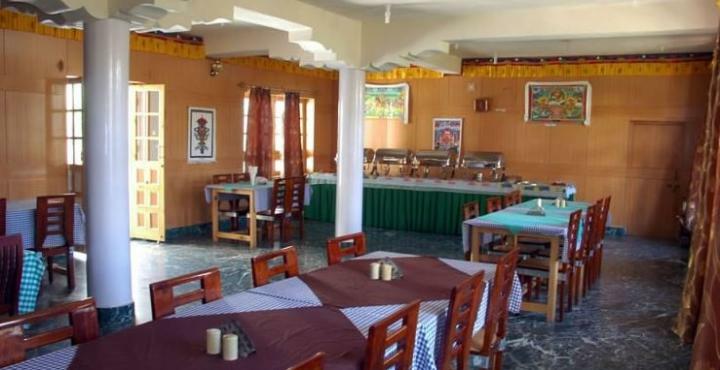 Hotel Snow Land is a budget property located at a distance of 5 km from Leh Kushok Bakula Rimpochey Airport, 477 km from Manali Railway Station and 1.9 km from Bus Stand. Famous excursions like Leh Palace(1.9 km), Shanti Stupa(3.6 km), Namgyal Tsemo raiMonastery(5 km), Stok Monastery(15.6 km), Thiks e Monastery(18.7 km) and many others are at an accessible distance. For an adventurous, comfortable and trouble-free stay property offers room amenities like ample parking. Currency Exchange, Airport Transportation, Safe Deposit Box-Front Desk, Parking, Bar, Room Service, Backup Generator, Travel Counter, Front Desk, Porter Service Available. Balcony/Terrace, Dustbins, Reading Lamps, House Keeping, Iron/Ironing Board, Ceiling Fan, Internet Access, H/C Water, Bottled Water in Room, Television Room. User reviews for "Snowland Hotel Leh"